Hello from Germany! I am here with another guest post for you, this time it comes from the lovely Kayleigh who blogs over at This is Kayleigh. Kayleigh is also a graphic novel fan so she has very kindly wrote a review of the new graphic novel, Snotgirl. Enjoy! Fans of Bryan Lee O’Malley rejoice! Those who are new to the comic game and picked up this title due to how highly anticipated it was, you can rejoice too! Snotgirl #1 does not disappoint and leaves you hungry for the next issue. Funny, fast-paced and occasionally quite dark, the narrative takes us into the mind and life of Lottie Person, a 25 year old gorgeous fashion blogger with severe allergies. The story follows her navigating life around flakey friends, meetings with fellow bloggers, trialed medication and controlling how much of her true self she reveals to her adoring fans through her regularly posted ‘candid’ selfies. The storyline is light, but the message is deep, it shines a light onto not only the fashion blogging community but to almost everyone in our generation. It reminds us how our online presence is not a mirror that reflects us, but a carefully constructed collage showcasing only the parts that we wish to share. It rightfully doesn’t shame the blogging practice; O’Malley and Hung cleverly use this career path that is often synonymous with the younger generation as a way for readers to relate to the characters and story. The constant presence of mobile phones and messaging doesn’t feel like its trying to be ‘down with the kids’ and the language used doesn’t make it feel elitist or too ‘try hard’. O’Malley’s previous storytelling shows his ability to not just invite you to watch a story unfold, but to grab you by the hand and throw you into the story itself, effortlessly allowing you to feel the haziness associated with youth; the anxiousness and sensitivity of Life At Sea, and the invincible power of love in Scott Pilgrim vs. The World. 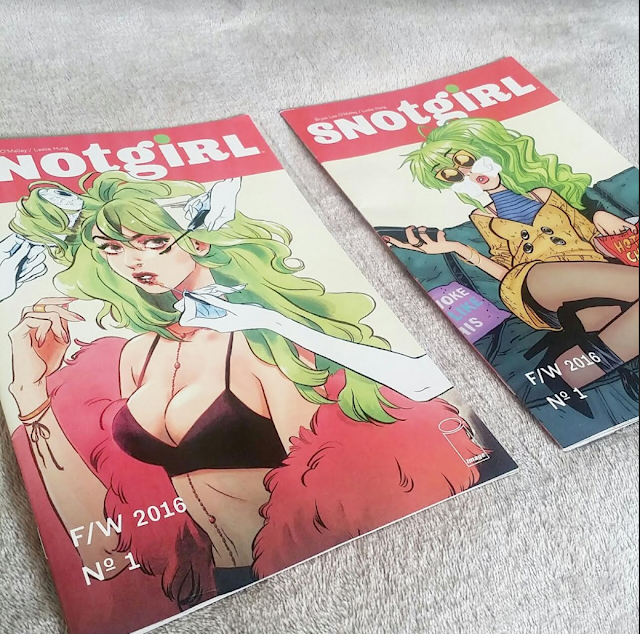 Snotgirl shows his constant evolution as a writer. It’s still effortless and relevant, but it’s also bolder and sharper. The feelings are real and the story moves quickly, leaving you wishing you had issue #2 immediately afterwards! Issue #1 is told through Hung’s beautiful and unique illustration style, combining both traditional comic elements with manga-esque line work. It offers both a refreshing change for a seasoned comic reader and will also catch the eye of those who are simply looking for a new comic to start. The colours are bold and striking and the brush strokes are strong and purposeful. A clever, relevant and beautiful export from two incredibly talented storytellers, Snotgirl’s first issue is simultaneously loud yet subtle, weird yet realistic, and graceful yet gross. Bryan Lee O’Malley & Leslie Hung’s first issue of Snotgirl delivers everything required to satisfy both seasoned Scott Pilgrim fans and those who have never picked up a copy of Seconds.